I think this is the very first wallie which I take 4 days to finish :) i'm soo tired. Comments and favs are very very appreciated~! the vector is very neat & I still see some minor color leaks here & there but they are not very noticeable. yuuki is looking lovely & you need to work a little bit more on the eyes, the eyes in VK is very important you need to make them attractive by adding as much as details/colors as possible ^^ I know you can do it & the bg is nice. Looks great. Like said by the people above, the blur passed the outlines so you need to earase it. The eyes, add more highlights and shades although for me it's already ok because the overall color of the vector is light colored. About the bg, I think the stone wall in the middle is a bit weird. Try to tone down the gray, maybe darker or lighten the outlines. And the side have some color leaks. Other than those, it's a great wallpaper. You got nice neat lines. Look very nice! I love the vines and the flower and esp yuki dress! Very detailed work and your improvement from your previous work is very prominent! Just two things. as pointed out by Sinever, her eyes need to have more vibrant colour and details! And the colour of the wall is quite pale, more constrast of colour can be done so that it will look more outstanding! I think that best part of the wall are the roses, nice outlines, you could add more shades/highlights on them. Like people previously said, the eyes need more work they look somehow washed away, like the picture is wet, and cause the skin is so pale you can't even see the white part of the eyes. I won't repeat what others said, I think she would have looked so much better with a different dress color, yenno pink with white frills? Good job ^^ and good luck with future projects. What an amazing improvement from your previous walls! it's oh so very pretty! so beautiful and i l;uv the scenery too! *favs* plz continue making more wallies :3 cuz ur other ones r nice too! It looks so pretty! I love the sweet colors. Waa~~ It's so cute! I like it! 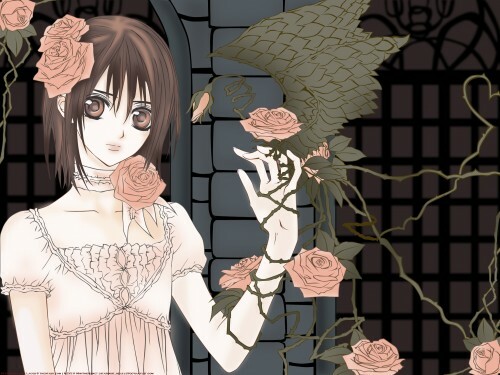 This wallpaper its as good as Sin-chan's Vampire Knight wallpapers! GREAT JOB! I really like how everything goes together.